Mechanics who need options when it comes to keeping many different vehicles around may find our supply of parking and car storage lifts to be a very good choice. Here at Best Buy Auto Equipment, we understand the desire to provide your customers with an added level of assurance and trust. 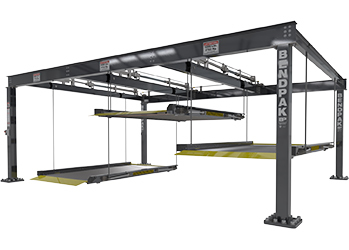 Choose from a wide variety of one, two or four post parking lifts from the nation's leading 4 post lift manufacturers: BendPak and Dannmar. 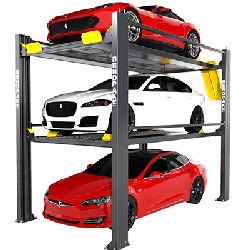 We also carry tilt platform and single column lifts for short and long term car storage. Our solid platform parking lifts keep the bottom car free of any fluid leaks and help protect your client's auto investment. Check out our Monthly Specials for great deals on parking lifts! 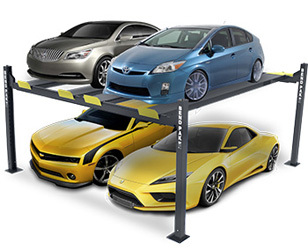 We also offer our value priced line of 4 post parking lifts exclusively from Auto Lift. Check out our In-Depth Lift Comparison. And for work safety, always look for Lift Certifications. 8,000 lb. capacity and large 3" cylinder, one-piece diamond-plate runways and scratch-resistant powder coat paint. The clearance between the column posts are about 6 inches wider than most hobbyist lifts. 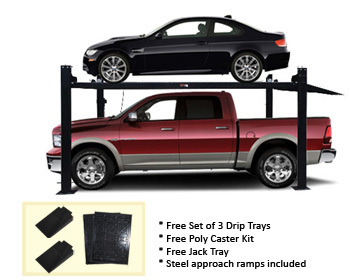 Overall Width (Base to Base): 103-1/2"
Max Clearance (under track): 70"
Car Park 8 Plus is a car storage lift / service lift with Extended length and extra height 8,000 lb. capacity and large 3" cylinder, one-piece diamond-plate runways and scratch-resistant powder coat paint. The clearance between the column posts are about 6 inches wider than most hobbyist lifts. Overall Width (Base to Base): 109-1/2"
Max Clearance (under track): 78"
The BendPak HD-9ST space-saver four post lift is a rugged, standard-height, space-saver solution with a 9,000-lb. lifting capacity. Perfect for vehicle storage and service -at the shop or in the garage. The HD-9 is your rugged, 9,000-lb. lifting solution. Perfect for vehicle storage and service-at the shop or in the garage. Whether you're a service professional or a DIY'er, BendPak's got the right lift for you. The HD-9XL is your 9,000-lb. 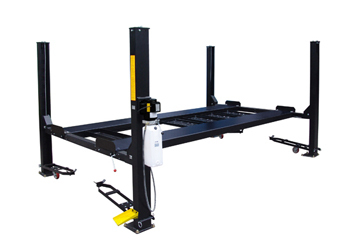 rugged lifting solution if you need lift a car or truck with a wider and / or longer wheel base. Perfect for vehicle storage and service - at the shop or in the garage. Whether you're a service professional or a DIY'er, BendPak's got the right lift for you. 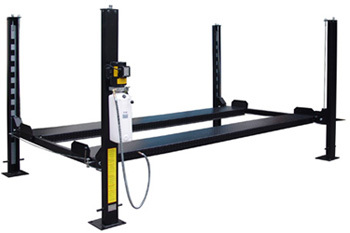 This model is available with optional casters, dip-trays, jack platform and more. The HD-9STX is your 9,000-lb. rugged lifting solution if you need get something heavy up high, but you don't have a lot of space on the ground to lift it with. Perfect for vehicle storage and service at the shop or in the garage. The HD-9XW is your 9,000-lb. rugged lifting solution if you need get something heavy up high, but you don't have an entire garage to dedicate to the lift. 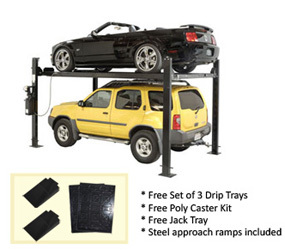 Perfect for vehicle storage and service-at the shop or in the garage. Shorter length and extra height, the HD-7P is the ultimate in compact convenience when you want the lifting power of a BendPak in a tight space. Shorter length, extra width, and extra height, the HD-7W is the ultimate in compact convenience when you want the lifting power of a BendPak in a tight space like a garage, service bay, or carport. This 6,000-lb. capacity double-wide parking lift, available in standard and extended-length models, safely converts your two-car garage into a four-car garage. No columns sit between the two parking platforms, which keeps this tandem lift’s footprint down to an admirably compact overall width. This 6,000-lb. capacity double-wide parking lift, available in standard and extended-length models, safely converts your two-car garage into a four-car garage. No columns sit between the two parking platforms, which keeps this tandem lift’s footprint down to an admirably compact width. The HD-9SW is the DIYer's ideal double-vehicle storage and service solution. Store two vehicles on four runways. Available with casters, drip-trays, jack platform and more. 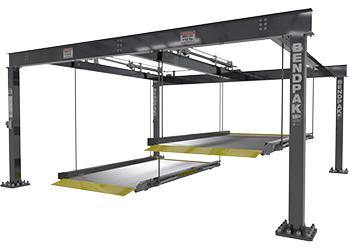 PL-14000 Triple Stacker Parking Lift auto stacker parking car lift The PL‐14000 by BendPak is a 4‐post auto stacker parking lift designed for indoor or outdoor operation and is the most cost effective way to triple the capacity of typical parking areas. The 3‐stacker PL‐14000 is the ultimate space saver allowing three vehicles to be stacked in a single parking space. 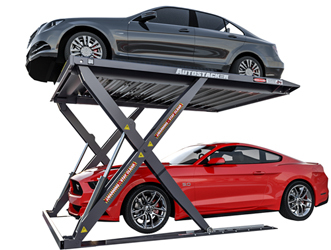 The revolutionary Autostacker™ PL‐6SR parking lift is a reflection of our continuing commitment to design and deliver innovative vehicle storage solutions that offer only the highest value to our customers. The space‐saving design means you can now stack one vehicle above another in the same space typically required for a single parking stall. Meet the HD-973P, whose patent-pending design allows the storage of three vehicles in a single parking space. Plus, its independent platforms mean you can park vehicles at the height of your choice. Ideal for sedans, SUV’s and full-size trucks. 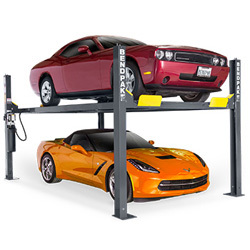 Overall Length: 242” & 200"
The PL-18000 by BendPak is a 4-post car stacker parking lift designed for indoor or outdoor operation and is the most cost effective way to increase the capacity of typical parking areas. The quad-stacker PL-18000 is the ultimate space saver allowing four vehicles to be stacked in a single parking space. Shared, ganged columns increase value by reducing the number of components required for multi-unit installations. Each lift uses a specially designed base frame that distributes the load making these unique lifting systems suitable for installation on virtually any residential or commercial concrete floor. If you want to make the most out of your limited parking space, whether it's personal or commercial, then you need a premium parking lift. BendPak has the solution: the PL-7000XR 2-Post auto stacker parking lift elegantly makes your parking spaces work twice as hard for you. This lift has a commercial grade hydraulic cylinder and heavy duty leaf chain. Max Clearance under Track: 77-3/16"
It is important to treat every vehicle with automobile during repairs, maintenance, and modifications. Everyone is concerned when it comes to making sure their vehicle remains in pristine condition in terms of athletic appearance as well as utility. This is especially true when you’re having your car worked on by others. It takes a great amount of trust for someone to loan you their vehicle for some type of operation. You want to make sure you can safely and reliably maintain it for an amount of time based on the customer’s need. Our impressive array of parking and car storage lifts have the features you need to safely keep vehicles stowed for short and long periods of time. 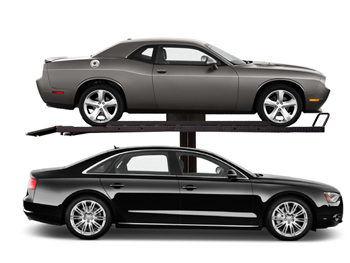 Our parking and car storage lifts are capable of easily holding multiple vehicles and boast impressive carrying capacities. This sturdy design is by no means rigid and unchangeable, as the unit can be easily moved and adapted to fit any need. A variety of heights and angles are easy to achieve. Optional aluminum approach ramps make mounting and unmounting vehicles an easy task. Multiple vehicles can be stored in one unit in order to save space without sacrificing on safety or stability. Some units feature non-skid grips and heavy-duty steel cables in order to provide the extra control needed to safely store even the most powerful vehicles. The most obvious concern for this type of stowing option is whether the unit can safely and reliably house the vehicle for longer periods of time. 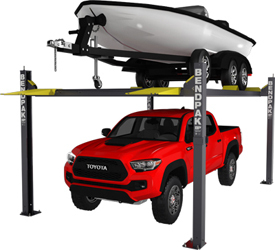 Heavy-duty visible locking systems, included cable connectors, and lightweight aluminum solid decks provide the added features needed to reassure any customer or client that their vehicle is in good hands when it is placed in one of our car storage lifts. Know that whether they are your vehicles or those of your customers, any automobile housed in one of these high-quality options is guaranteed to be safe and undamaged.